Last Saturday was Spring Commencement at Tech and I was pleased to present diplomas to 861 graduates. 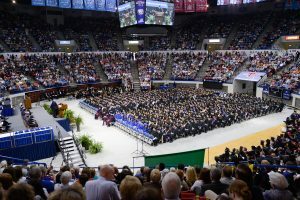 I believe that commencement day is the greatest day of the year on our campus, and this one certainly did not disappoint. 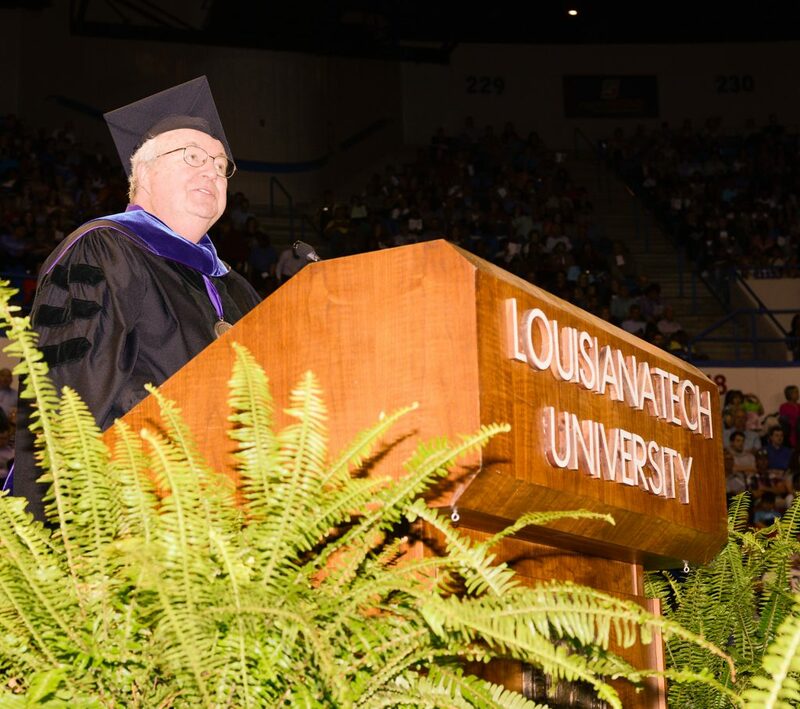 We were honored to have John Hofmeister, former President of Shell Oil, as our speaker and he made an inspiring address to our graduates. John continues to be one of the nation’s greatest leaders for the energy industry and a key spokesman for enhancing the nation’s energy policies. I enjoyed having him visit with several of our community leaders over dinner on Friday evening before Saturday’s ceremony. 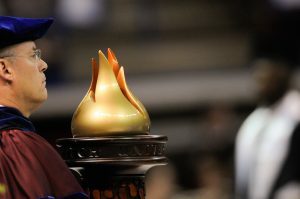 During commencement, we also presented awards to three highly deserving faculty. Tara Haskins (nursing), Jeff Pike (civil engineering) and Sumeet Dua (computer science) were all recognized for excellence in advising, teaching and research. Each of these faculty are tremendously dedicated to our students and serve our institution in many different ways. They are all highly deserving of the special recognition. One of the things that I love about commencement is seeing the smiles of all of the graduates as they walk across the stage. 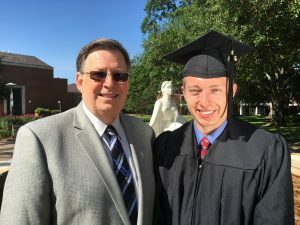 It also gives me an opportunity to reflect on the amazing and life-changing experiences of the graduates, and to thank some of the students who have provided strong leadership and service during their time at Tech. 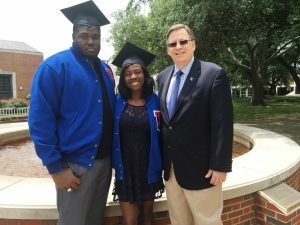 I presented diplomas to Laticia Watson and Joshua Robinson, who were outstanding track and football student athletes, and who are also husband and wife. I had run into them earlier in the week as they were standing in front of the Lady of the Mist in cap and gown for their pre-graduation photos. I love seeing our students taking pictures in front of the Lady, our most important campus icon, and I believe that this reflects the respect that these students have for the institution – its history, people, traditions and values. I presented Sam Hussein with his diploma and reflected on all of the leadership that he had provided to the Union Board, and many campus activities that he led over the past three years. And I know that his father, Magdy, had to be incredibly proud of the accomplishments of his son. I presented D’Andre Antoine Lee with his diploma, but it was not until after commencement that I found out that he had gotten up out of his seat during commencement to help a disabled person in the audience stabilize his chair and stand up so he could go to a more comfortable location – a symbol of caring (one of Tech’s Tenets) demonstrated by D’Andre. D’Andre’s mother was certainly proud of his graduation and she shared more with me about D’Andre’s incredible personal challenges during his first year as a student at Tech. 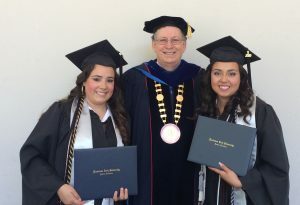 I presented Maria Soto Torres with her diploma, and also her sister Cristal Soto Torres. I had met Maria earlier at our Early Childhood Education Center where I learned that Maria and Cristal are two of five siblings who chose to attend Tech, all making the long and expensive trip from Guanajuato, Mexico. Maria and Cristal are both graduates of our Family & Child Studies program. I presented Jayde Long with her diploma, and reflected on her time as an undergraduate at Tech as an Orientation Student Leader, and then her commitment to continue on to get her Masters in Speech-Language Pathology. I presented Anna Fuller with her diploma and also congratulated her as being one of fourteen spring quarter graduates who completed their degrees with a perfect 4.0 GPA. And I know that her mother, Donna Fuller, who is the head of our nursing program, was also very proud of Anna’s accomplishments. I presented Shane Puckett with his doctoral degree, one of 17 graduates of our doctoral program in the spring and one of 49 for the year. Shane is an instructor in our communications program and Director of Forensics and Debate. Shane had been in my office recently with a couple of his students who were competing well in international debate events in New York and Oxford. They were all beaming with pride knowing that our students competed toe-to-toe with the best debate students around the globe. These are just a few of the many stories that were being written on Saturday. I know that all 861 of our spring graduates have had special experiences and will have lasting impressions of their time at Tech. We are grateful that each one of them chose to make Tech their college home and we look forward to seeing the impacts that they will make in the future. 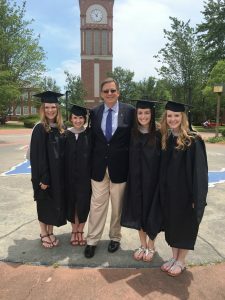 They will join more than 99,000 of our graduates since 1894 who have a brick in their name on Alumni Walkway, and I can’t wait to see them back on campus to find their brick!